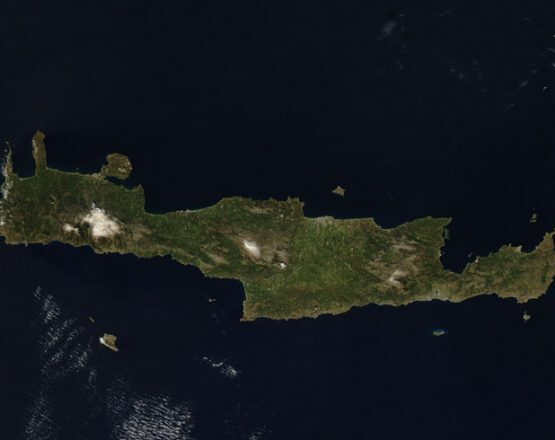 Set in the Mediterranean sea is the mythical island of Crete, the cradle of European civilization. This island provided refuge to the Goddess Rea to give birth to Zeus at its highest mountain peak! The medieval and Venetian city of Rethymno is only 1 hour drive approx. away from each airport of the island. 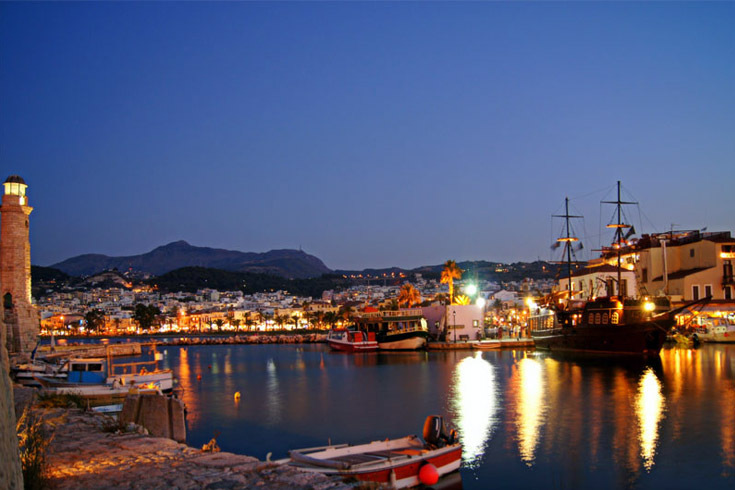 For those who take the route of the Argonauts you sail from Piraeus Athens either taking the fast ferry that within 5 hours reaches the shores of Rethymno, or you can take the root of Argo that will sail under the starry night bringing you as the day breaks to Rethymno. A university city majoring in Humanitarian studies and economics. The students replace the swallows as the seasons change every year giving the city this way another character apart from tourism, agriculture and farming.The city is also known as the city of the dolphins as depicted on ancient coins, But till this day Rethymno is visited by these beautiful creatures on the North and on the South coast of the region. Rethymno has approx 27000 souls and is stretched along side the second longest sandy beach of Europe. 12 km of soft sandy beaches embraced by the Cretan sea to the North, Flanked by the Ida mountain chain and highest peak of Crete to the south of the city. Beyond these mountains we have the Libyan coast of the south. Ulysses or all modern or mythical visitors of Crete its a captivating island and its it’s up to you to decide how many times you will return. For all those that within them there is a trace of Ulysses of this world-Nostos the boat of Ulysses that sunk of Crete-Nostalgia rests in Rethymno. A paradise of earthly dreams away from the noise of large and restless cities and finally alone but not lonely. The town of Rethymno has given us indication of human inhabitation from 1600 B.C. (Late Minoan III) until the Byzantine period. For us that live here we stroll through the streets of yesterday, tomorrow and today, each time walking through this town for our daily chores. The medieval and Renaissance characteristics of our town – the beauty of the narrow streets, the gentle afternoons and star struck evenings – are what our soul feeds on. We hope that this can also can be communicated to all visitors. Overlooking the old town is the fort of Rethymno, built in the 16th century. It’s one of the first things a visitor casts their eyes on once reaching Rethymno. Designer of this fort was San Micheli, responsible for fortifying the island of Crete during the Venetian occupation. This military architect from Verona designed many forts for the democracy of Saint Marcus in Crete but in many cases the plans were compromised due to financial difficulties. Today under the foundations of the fort is the ancient temple of the Goddess Artemis-Diana–protector of the city of the dolphins with her brother Apollo. Neither Apollo, Diana or San Michelis fort protected the city of Rethymno from falling in the hands of the Ottoman empire in November of 1646. Winter though has ended long ago for this Fort, so in summer under the moonlit evenings we hold the renaissance festival with concerts, plays, exhibitions hosting Hellenic and foreign artists. Today the Fort rests above the old town like a patient guardian. Entering the Fort through the heart shape bastions we start seeing the grounds within the walls of this monumental building. We also see the church of St. Francis that became a Mosque Ibrahim Han Ntzami by the Ottomans. We can also see the headquarters of the Rector of Rethymno, the water cisterns,the church of St.Nikolas and of St.Theodore. New addition is the open air Theater Erofili. Opposite the entrance of the fort we have the old Ottoman prison hosting the archeological museum of Rethymno today. The exhibits vary from the Neolithic period until Byzantine of the whole region of Rethymno. At the foot of the hill of the fort lies the old Venetian harbor with its fishing boats, the well known Greek cats regular customers of fish tavernas in Greece. For all those who are early birds you can still see every morning the fishermen returning to the harbor with the catch of the day. The fishing boats arrive as the sun rises, eager customers await as the bargaining begins, the cats return from their evening prowl expecting their silver meze! Whilst the sun becomes brighter as the day unfolds the lighthouse of the harbor is lit these days by the Mediterranean light, this lonely lighthouse is of the Ottoman period. As its stripped today of its usage it stands proud at the entrance of the old port with great seriousness. Founder of this light house was Mehmet Ali governor of Crete 1830-1840, founder of the Farouk family of Egypt. Leaving the port as you make your way in the old town you reach the Loggia. This building was built in the 17th century mainly to facilitate the Venetians functioned as a meeting point, one of the few institutions out of Padova and during the Ottoman period became a mosque. Today it sells museum copies. As you continue your walk up Paleologou str. you reach the Rimodi fountain 16th – 17th century. While Rimondi was the rector of Rethymno envious of the fountain in Heraklio of Morozini he built this fountain the water supply came from mount Vrisina to the South of Rethymno. In the center of the fountain we can still see the coats of amour of the family of Rimondi, the 3 lion heads representing the Peoples Democracy of St.Marcus, written in Latin on the top you see it’s the fountain of Liberty. Once the Ottomans took the city they will add a dome that today only part of the arch can be seen and a small fragment of the ring of the dome. Round the corner of the fountain on Arabandzoglou street you can see the workshop of Thomas, the saddler of the warm blooded part Arab horses of Crete, known as the sacred horse of St. George. Small but feisty little horses with a unusual stride, strong mouth and not put to labor. All horse lovers can find tack as well as advice needed for their little mischievous horses of St. George. Heading to the South of the fountain taking the street of Ethnikis Antistaseos we reach to our right the Odeon of Rethymno. This building of the 17 century functioned as a church as a mosque and today is the small concert hall, music school and land mark of the city of Rethymno. As it still has one of the tallest minarets of its time designed by a local. -The Dzami Neratze. Continuing on Vernardou street keeping the mosque Neradze to our left we find the folklore museum of Rethymno. on our left again, in fact the next door is the Fyllo cadaifi workshop of George and Katerina Hadziparashu. This sweet and friendly couple lives in an old Venetian house that still bears a stunning 17 century inscription. There are very few people still today that make fyllo pastry and baklava pastry by hand. Seeing and in this case tasting is believing! With the taste of honey and walnuts still in our mouths we return back through Vernardou street that in the evenings is one of the hot spots for mezes, live music and cafés. Walking towards the Odeon-Mosque-Church you can see the newly found square in the heart of the historical center of Rethymno. Walking into the square opposite is the old school of Rethymno still referred to as the Turkish school. But that’s just half of it! Actually to the left of the square we have St.Francis Basilica that also was connected to a monastery! That was a long time ago somewhere in the 16 century, but in 1646 Cara Mussa Pasha that seized Rethymno sent to Istanbul –Constantinople- a sample of local specimens. One of which was Efmenia Vergitsi that ended up becoming the Candin the second favorite wife of the Pasha her new name was fresh morning rose! This Rose never forgot her past, so when she had a son and wanting to spear him and her own life once the Sultan past away by his older sons she turned to her roots for refuge. As all logical flower should do in moments of crisis. So St. Francis now under Ottoman rule becomes a school, A school for Muslim and Christian children all children female and male! Rethymno Earned its niche as one of the cities of fine arts.Where the school ground ended the Roses son had his musque (Neradze), sells of the monks of St.Francis became part of classrooms. That’s called multicultural recycling! Returning to Ethnikis Antistaseos up towards the Gate la Porta Guora one of the main 3 entrances into the old town but the only one in such good state today. Going through and under the arch on our left we see the 4 Martyr Church and on our right the workshop of Papalexakis, a musician that makes many traditional musical instruments,famous though for the quality of his Lyras. This is one of the work shops in town, but this workshop made the Cretan Violin –Lyra –that represented us in the Eurovision song contest the years that –we became Number one! For all those who wish to see the undiscovered aspect of the island there are many options. To the south of Rethymno we have the route of Amari valley going round part of the highest peak of Crete Psiloritis. If we don’t end up stopping in one of the many villages on route we find ourselves in Gortys the Roman capital of the island. Driving through Prases village we make our way out of Rethymno into one of the most fertile valleys of Crete. Under plane trees, walnut trees and lush vegetation we take the route all the way down to the Libyan coast. Taking the route from Rethymno through the Amari valley you actually make your way back through time. The villages you meet on your way played a very important role during the second world war helping the ally forces to escape. Apostoli one of the villages you meet was the residence of the Abbot of Preveli monastery through his family house 2500 troops escaped. Apostoli was named after the local Christian martyrs one of the first that embraced Christianity. During the reign of Decius in Roman times these young Christians were put to the sword! The valley of Messara is breathtaking and has given us finds from Bronze age to Roman period. By the time you reach Gortys, you begin to regress through time, we start this journey through time from the oldest Basilica of Crete 6th century, walking in the footsteps of St. Paul and first bishop of Crete Titus. We continue walking beside some of the oldest olive trees of the island reaching the Roman Odeon. Beyond that the Queen of antiquities the oldest law inscription of Europe 5th century B.C. By now we also find a botanical rarity the everGreen plane tree Orientalis, the tree that Zeys brought young princess Evropi to after crossing with her the Libyan sea on his back while having taking the shape of the bull. After this long journey he placed her to rest under this tree. In her dreams he fertilized her immaculately! When she awoke she gave birth to Minos Radamanthis, Sarpidon, her name reaches us till this day as Europe. The statue of young Europe on bulls back has traveled to Italy today. After our stop there we continue for Matala, driving through Phaistos, the second in importance Minoan palace of Crete. As Phaistos seems to be floating over the plain of the most fertile plateau of Crete Mesara we are elevated and lifted up closer to the Gods of antiquity of this island. Understanding yet another aspect of the Bronze age Minoa civilization. Returning back down to sea level we find ourselves at Matala. Matala today is a splendid place to swim, famous for its man made caves. This beach and caves in the 60’s and 70’s was a must for all those exercising flower power. Little did anyone know at the time that this hippy paradise and fishing port of the locals was in fact an area of great archaeological importance. Matala must be one of the few sites that has captivated people’s mind from the 70’s AD all the way back to bronze age spinning through the Roman and the Hellenistic period. Matala is a perfect way to end your day swim watch the sun go down, realizing that you are looking at the same sea that Zeus crossed when bringing Europe to Crete, the sea the Minoans sailed, all Hellins crossed wanting to reach the East and North coast of Libya and finally during Roman times Africanus looked over before crossing and giving his name to the continent. To The south of Rethymno with its clear blue sea and impressive gorges is only just over an hour’s drive away. For those who wish to be a bit more adventurous, one of the many places worth visiting is Sfakia. Either for those visiting the Samaria gorge long way 12 km. or glimpses. For all those who wish to see one of the evacuation points, or the root to the last frontier of Europe before the continent of Africa, the small island of Gavdos, the island of the siren Kalypso the last stop of Ulysses before he returned to Ithaka. Another outing that has less time travelling is the route that takes you to Spili. Reaching an altitude of 500 m above sea level where you can taste the fresh water of the springs shaped as lion heads in the square of the village.You also find here one of the sacred plane trees Orientalis. You can and also sweeten your lips with yoghurt and honey and walnuts. After this break you can continue down to Aya Galini one of the many beaches of the southern coast of Rethymno within 1 hour’s drive. In Crete you don’t say each man is an island, but each one is a beach instead, beside Ag. Galini there is the beach of Akoumia, Triopetra, Ag.Pavlos and the silver mare…all you need is a good sunblock! Another route that you can take to the South of Rerhymno is the one leading to Plakias. You head South taking the Spili route reaching the village of Armeni where there is the late Minoan Cemetery with the chamber thumbs. This site in spring is full of wild orchids. Until recently it was a mystery to where the actual Minoan city was but finally a few months ago the mystery was solved! Leaving Armeni we continue towards the Libyan sea. On our way down we go through the clapping gorge of Kourtalioti a nesting area of the Griffon vultures, the source of the spring of Mega Potamos that reaches the palm beach of Preveli by the chapel of St. Nicolas. As we continue through the village of Asomatos driving towards Plakias we reach the monastery of Preveli. This monastery overlooks the Libyan sea you can see the island of Gavdos and Paximadia in the distance. A place of refuge during the Ottoman period and center of resistance like many monasteries during moments of crisis in Greece. Finally during the Second World War again it took up the responsibility of providing shelter, it became also center of supply for allies and local resistance. Preveli monastery prevails one of the most impressive wooden screens of Greek Orthodoxy and iconography as well as the miraculous cross visited by Christians from all over the world. Under the monastery is the palm beach of Preveli. The phoenix Theophrastus palm, this beach was used during the evacuation and today is still used by the few hippies still left on the island..The small spring of the chapel of St. Nikolas becomes a forceful river embraced by palm trees that finds its way into the sea. West of the monastery is the beach of Plakias, a resort famous for surfing in summer, within the area we have the coves and beaches of Amoudi, Skinaria and Suda the beach from where the Saracens began their invasion of Crete in 824A.D. putting an end to the first Byzantine period. These pirates after been expelled from South Spain come to Crete seeking a better fortune, today this beach in spring has king fishers, egrets and herons instead. Going through the largest olive field on the south of Rethymno. This close outing brings you up to 500m above sea level where the Monastery of Arkadi is part of this route was used by students of Pythagoras performing their pilgrimage to the cave of Zeus. Reaching Arkadi Monastery you see one of the most impressive facades of Western Crete designed by Stefano Serglio a student of Rafael. This fortified monastery has been declared as one of the monuments of European liberty due to its role in the 19 century during the Ottoman occupation. Within the peaceful grounds of the monastery in the museum you can see sample of Cretan school of iconography. Here you begin to understand the schooling of Byzantine iconography of Damaskinos and Elgreco. Continuing from Arkadi heading East we reach Ancient Elefterna, one of the Hellenistic capitals of Crete. Alexander the Great imported from this city his famous archers when going into India. This City and Acropolis was destroyed by the Romans, today what can be seen are the water cisterns, as well as the excavations down bellow of the Geometrical, early Christian and Roman period. The famous statue of auxer in the Louvre was sculpted here, the twin sister statues were separated and her twin sister today is in the Archeological Heraklio museum. At this stage you have 2 options you can either walk from Elefterna to Margarites using the ancient path going through the ancient sites for 2 and half hours. Or you can within 15 min. by car reach the potters village of Margarites. Here you can after pottering around eat under the shade of the mulberry trees enjoying the view of the olive field and the Cretan sea in the distance. Uh!!! this is the life! On your way home you can use the new road through Panormo and even stop here for a swim, watch the sun set under the tamarisk trees! Crete described by Homer as a mythical island, the island of the winds and those who live in bliss.But it’s also an island of Heroes and today you will see the city of the 7 labor of Hercules, Heraklio! Hercules has to catch the white bull of Crete and this is done after great effort in today’s capital of the island. This sacred bull was the bull of Poseidon the God of the sea and the tremors… This beast that reached Crete from the sea tortured the people of this island until Hercules freed them. Taking the high road along the North Coast heading East we make our way towards one of the 2 airports of the island. Once driving over Ag. Pelagia, we get a glimpse of Heraklio. As we start to descend down to Heraklio on the highway to the South of the city and to our Left we see a mountain, its shaped like a mans face in profile lying down Giuhtas. The ancient Hellenic Gods are so different from how the Romans perceived them to be and adjusted them to their needs. Crete is one of the few islands that foreign cults, religions were introduced without meeting intolerance.The Ancient Egyptian, Judeo, Christian religion reached our shores safely. Poor Zeus seeing that the locals turned to Christianity so easily feeling unloved returned to his home land like all the earth bound Cretans and lay down to sleep providing protection to what once was the palace of one of his sons -Knossos- In Hellenic mythology if the Gods are no longer loved the perish…all we need is love! Knossos the most important Minoan Palace of Crete, ruled by Minos with the labyrinth and Minotaur awaits you! Within the city center there is part of the old medieval walls and buildings as well as a small branch of museum open to the public. This city was the birthplace of Elgreco and Kazanzakis. Within the Mediterranean sea the Cretan diet is world wide known for it has past present and future. This heritage of tastes goes all the way back to bronze age period, showing us the way towards a healthier way of existence. The recent archaeological excavations have not only given us ruins and art but anthropological and inscriptions concerning the diet habits of the Minoans. From the Linear B tablets new information was brought to light, connecting the diet of the past of this island and its bond with today’s diet. With the Roman conquest of Crete and spread of this empire the changes were subtle, the Romans imported art, technology, ideas within their empire, but Crete was their stepping stone to cross the Lybian Sea, as well as hosting the capital of Cyrene. We have Roman texts referring to the export from the South of Crete of fish served as delicatessen in Rome. But the most important substance of the Cretan – diet is the olive oil. As mentioned before the south of Rethymno is the largest olive field in the eastern Mediterranean. The relationship of Crete with this tree is not just economical. Olive oil is an essential element of our daily diet as well as for the Minoans 4500 years ago. Traditionally today as well as during Bronze Age the people of this island consume a great variety of beans, bulbs, and wild greens and seldom meat and fish. The vitamins of the olive oil cover many of the daily needs of the inhabitants of Crete. This might be astonishing since Crete is an island on one hand and has a large number of flocks and herds on the other. Food is not only body fuel, taste, texture, art, scent, but a journey of all those unknown characters that distilled all their love, all their care and devotion to those they have nurtured. A simple portion of food on a plate offered before their loved ones, visitors or even a stranger. Today in Rethymno we have certified restaurants “Concrete” where you can also taste, experience the Cretan cuisine. 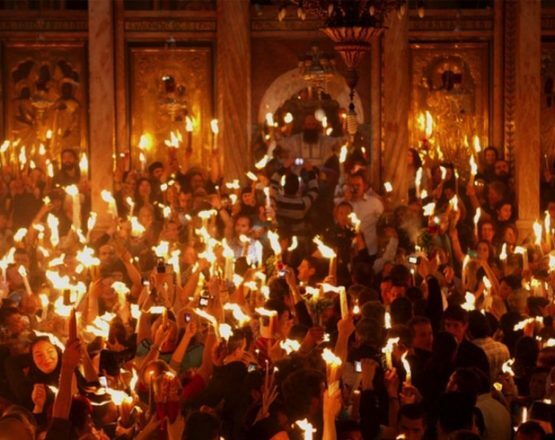 If you are lucky and the gods take a liking to you, you will “hear” the scent of the Cretan food!. As Cretans “hear” the smell, they do not smell the scent of things, of food and of life itself. This way you will “hear” the sound that carries tradition of centuries cooked on a fire a long time ago. That’s another way of stirring things up! Founded 1887 and it is housed since 1991 opposite the entrance of the Fort of Rethymno. The finds are in display in chronological order and entities. The finds of the Neolithic era are from the cave Gerani (animal bones, tools, idols). From Melidoni cave first Minoan period are the black burnished vessels, from Monastiraki clay model of house seal stones, Camares pottery, idols. There is also table offering from sanctuary peak from mount Vrisina. Late Minoan Period displays clay sarcophagus from Armeni. You can also see tools, helmets from the same period. From Latter Periods we have statues and coins. Established in 1973. In 1995 it is transferred to the 17th century Venetian house at 20-30 Vernadou str. Apart from the architectural interest of this building with its courtyard it hosts 3000 exhibits with in 5 galleys. All the traditional profession and old guilds can be seen here as well as the textiles of 19th century accompanied by looms and the techniques of natural dyeing. Here we have an exhibition that displays tradition of the 19 century textiling and handicrafts.A sample of the dowry given to the bride for the couples new life together. Housed within a lovely Venetian Building that has been recently renovated we have 45000 samples of sea life and fossils. Next to the Cathedral of Rethymno in 1994 the Ecclesiastical museum was founded. It displays 152 Ecclesiastic relics as well documents that date from 1816-present day. Most of the relics are from the first church established in the city of Rethymno. This church has one of the oldest clock towers built by the Italian craftsman Jacopo Solare in 1894. The Dolphin city Rethymno with its long stretch of sandy beach that starts from the historical center of the city until as far as the eye can see is the closest place to swim. Since you can even take your bicycle taking one of the cycling routes to the beach choosing your favorite spot. The beach of Rethymno meets all blue flag standards such as safety, accommodation and water quality. Under the watchful eyes of the life guards you can swim, water ski, water parachute, take part in volleyball tournament as well as many other water sports. The Beach is provided with umbrellas and sunbeds, even if you have your own keep in mind that we are sharing this sandy beach with the loggerhead sea turtles…watch out you don’t disturb their nests while sticking your umbrella pole in the sand. For information and donation s concerning the sea turtles you can find kiosks as well as the N.G.O. Archelon. Speaking of marine life there are many diving centers that can guide you, teach you and show you the diving hot spots of Rethymno. Rethymno is one of the cities where the sun sets are magnificent. The sun seems to slip over and behind the white mountain chain of the West revealing an emerging city with its fort and old town. Giving you the impression as if it has emerged from the sea it self. All this can be revealed to you under the flight of swallows and swifts as you lean into the afternoon. Either going for a stroll around the fort along the sea road, or sipping your ouzo whilst the canvas of the sky changes before your eyes!